Praise the Hop Gods, Long Beach. Steady Brew Beer Co., the city’s latest brewery among an already stellar lineup of hop-centric watering holes, is having a soft opening today at 5 p.m. (and that also includes 5 p.m. openings on Saturday and Sunday before the grand opening in a few weeks) at their new brick ‘n’ mortar at 2936 Clark Ave.
And given that we can have fresh Steady draft over delicious Steady cans, this is a win-win. Whenever people think I’m stepping into The Attic, I am actually stepping into the Belmont Heights Liquor because I have a somewhat unhealthy obsession with liquor stores and ma ‘n’ pa markets (including the actual Ma ‘n’ Pa Grocery off of Roycroft). From Benson’s Liquor welcoming me with its utterly awesome neon sign to Stearns Liquor reminding me of how Long Beach was ahead of the craft-beer curve (and reminding me of how beer writer Aaron Carroll talks about Stearns being the sole place to score Sierra Nevada in the entire city back in the early 1990s), I have a soft spot for these local stores because they remove me from the capitalistic consumerism that is a Total Wine or BevMo, and—to be honest—I get some beer there I can’t score elsewhere. This includes discovering little gems like a made-in-Long-Beach, black-canned six-pack of Steady’s Grasshopper IPA. 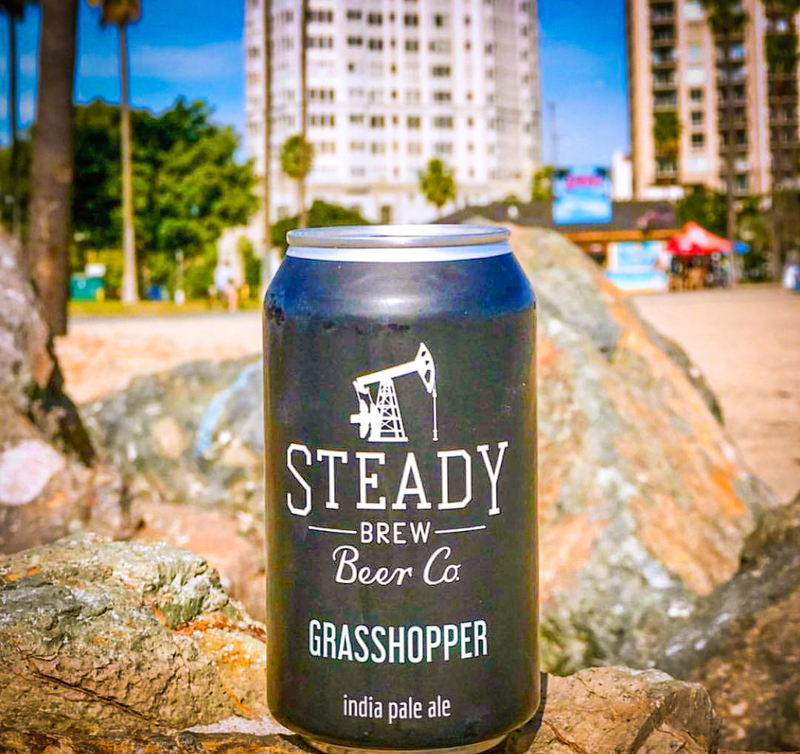 The tiny but mighty operation known as Steady Brew Beer Co. has been selling its beers for a bit, but now the time has come for them to open their first tap room near Clark Avenue and Spring Street in East Long Beach, bringing a much-needed dose of craft beer to the area, which is otherwise known for nothing but Baja Sonora. The crew began moving in their brewing equipment at 2936 Clark Ave. after scoring an alcohol license back in February, and they’re ready to start pouring for the public. “We will have limited beers for the soft opening—Thirsty Bird [Blonde Ale], Grasshopper [IPA], and Pumpjack [Pale Ale]—with a full beer list for the grand opening in a few weeks,” said co-founder Robert Booth. Thirsty Bird runs at 4.3 percent ABV; Grasshopper sits at 6.4 percent; and Pumpjack sits at a session-able 5 percent. Steady Brew Beer Co.’s first tap room is located at 2936 Clark Ave.